From 1933, the EFEO engaged the services of a professional photographer, Jean Manikus, assisted by Nguyen Huu Tho, who created a photographic service that worked until 1959, resulting in the important heritage collections of the EFEO. 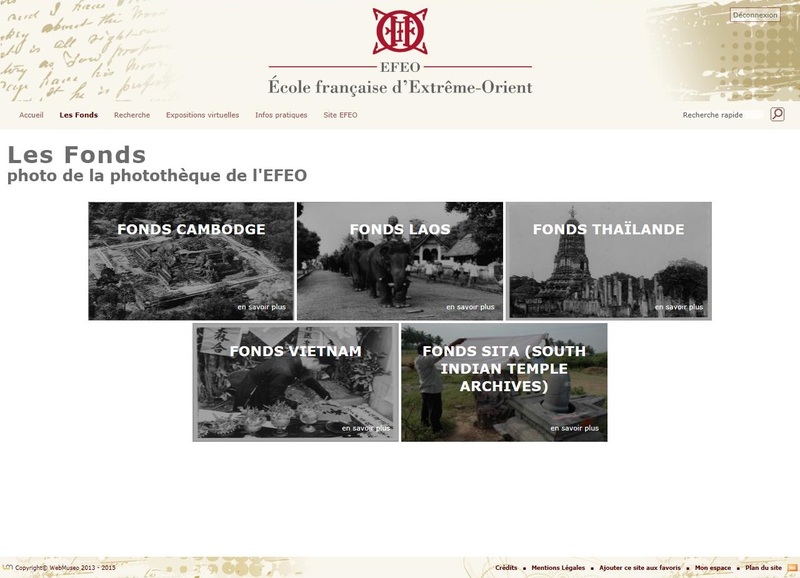 When, under the pressure of political events, the EFEO had to move its headquarters from Hanoi to Saigon in September 1954, a copy of the photographic collection was sent to Paris where the headquarters of the School were eventually installed in 1961. The EFEO library in Paris was thus created, taking over from that of Hanoi. Today, more than 180,000 photographic items are kept at the library in Paris. The media, reflecting the evolution of photographic techniques, are different in nature: glass plates with silver gelatino-bromide; negatives; slides; silver prints and colors; digital photos. The themes illustrate the richness of the disciplines researched at the EFEO: architecture, archeology, epigraphy, ethnography, art history etc. Because of the history of the School and its missions, Cambodia and Vietnam are particularly well represented in the collections and, to a lesser extent, Laos and Thailand. These photographs attract major academic interest, complementing historical mission reports and publications in periodicals. In 2002, a digitization campaign was initiated in order to ensure the conservation of photographs and to disseminate the digitized photos to the academic community and the general public. The content of the website (text, graphics etc.) is protected by legislation on intellectual property. Any reproduction, total or partial reproduction, any use, any adjustment or modification by any means and by any person without the permission of the EFEO is strictly prohibited. To access the digital photo collections please visit the EFEO website. Six spectacular photographic panoramas of Hong Kong, taken c. 1900, were painstakingly conserved by Nicholas Burnett and colleagues at Museum Conservation Services at Duxford, Cambridge, along with one panorama of Macau, one of Canton, and one of Medicine Hat, Alberta, taken in 1913. The panoramas form part of the impressive photographic collection of the Royal Commonwealth Society Library in Cambridge. The conservation process was quite complicated and took 21 months. A short report of the project together with photographs taken during the conservation works can be found on the Cambridge University Library Special Collections blog.